Growing carrots, or any root vegetable, can be a bit of a gamble since you can't see how well they are doing until you harvest. Even experienced gardeners can encounter problems growing long, sweet carrots. Very often carrots can disappoint with bland, misshapen, tough roots. But given loose soil, some cool weather and plenty of water, there's no reason you can't grow sweet, crunchy carrots. Carrots are part of the Apiaceae or Umbelliferae family, along with dill, fennel, and even the wildflower Queen Anne's Lace. You will see the resemblance in the leaves and flowers. Carrots are best known as long, orange roots, but they actually come in several colors and shapes. Foliage: Finely dissected, fern-like compound leaves. The leaves are edible, but they contain furocoumarins and may cause allergic skin reactions. Flower: Carrot flowers have 5 petals and sepals and are born in compound umbels. Roots: Most are about 1-inch in diameter and anywhere from 1-inch to 12 or more inches long. Carrots can be grown just about anywhere, even indoors. Since they are biennial, the USDA hardiness zones don't really matter. Root: Most grow about 1/2 ft. x 1 1/2 inches in diameter, but there are small, round carrots and some that grow over a foot long. Leaves can spread about 6 - 8 inches and grow to about 8 -12 inches high. Even though the roots are growing underground, carrot tops need full sun to light shade, for the carrots to grow quickly and develop their sugars. When to harvest your carrots will depend on the variety you are growing, but the average is about 50 -75days, from seed. Use the days to harvest guide on your seed packet as a guide for knowing when to start picking. Test that the tops of your carrot plants have filled out to the expected diameter by feeling just below the soil line. The only true test is to lift one and taste. Don't try and harvest too soon, thinking you will get sweet baby carrots. Small carrots in the store are either a particular variety that matures small or large carrots that have been ground down to baby-size. Immature carrots will be bland because they have not had time to develop their full sweetness. If your soil is very soft, you can twist and pull the carrots from the soil. To be on the safe side, it is wise to loosen the soil sightly before harvesting, making sure not to stab the carrots in the process. Remove the leaves, once harvested. The leaves will continue to take energy and moisture from the roots, leaving them limp and lessening the sweetness of your carrots. Soil: Carrots need a loose, well-draining soil. Rocks and clumps will cause the carrot roots to split and deform. Growing carrots in raised-beds with fluffy soil is the ideal situation. Carrots do not grow well in highly acidic soil. A soil pH in the range of 6.0--6.8 is recommended. And because they are grown for their roots, don't go overboard with nitrogen fertilizer. When to Plant Carrots: Carrots grow best in cool weather. 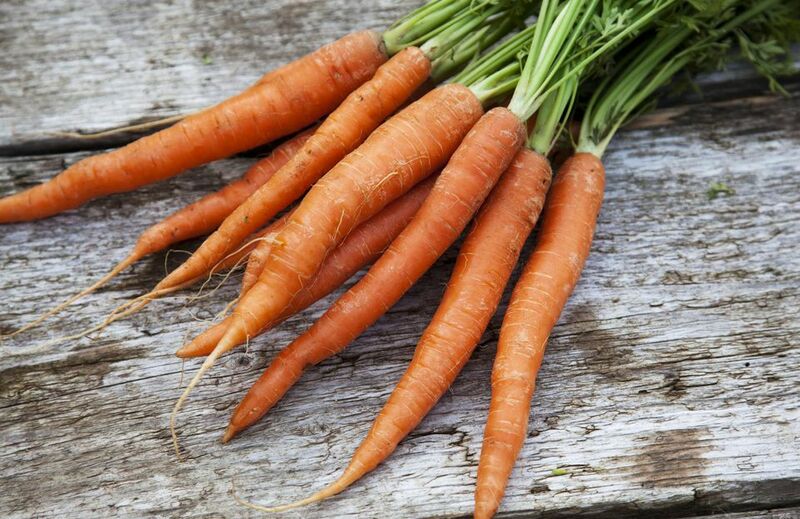 You can begin planting carrots as soon as the soil can be worked in the spring, even 2 - 3 weeks before your last frost. You can succession plant carrots every couple of weeks, throughout the spring. In warmer climates, you may have better luck growing carrots in the fall, through the winter. Planting Carrots: Since carrots are grown for their roots, they are direct seeded in the garden rather than transplanting and disturbing the roots. Carrot seeds can take up to 15 days to germinate. Keep the soil moist until seedlings appear. To prevent the soil from crusting over and making it difficult for the seeds to sprout, you can plant the carrot seeds with radish seeds, which will sprout first and loosen the soil. Carrot seeds are tiny, making it difficult to plant them evenly. Plant them only about 1/4 inch deep. Spacing the seed about an inch apart is ideal, but impractical. Chances are good you will wind up doing some thinning. Thin any plants that are within a 1/2 inch of each other, when the seedlings reach 1 - 2 inches tall. Snipping or pinching the seedlings off at the soil line is the best way to avoid hurting the remaining roots. If you need to thin again later, you can use the tiny carrots in salads. When you've finished thinning, your carrots should be far enough apart so they won't rub shoulders when mature. Carrots require a loose well-drained soil. They will fork and deform if they meet with the slightest resistance, like a rock or hard soil. If you can't provide loose soil in your vegetable garden, consider growing carrots in a container. The shorter finger-types or small round carrots, like "Paris Market"', are ideal for containers. Water your carrots with at least 1 inch of water every week. Mulching will help conserve water and keep the soil cool. If your soil is not rich in organic matter, supplemental feeding will be necessary about 2 weeks after the carrots tops emerge. Any good vegetable fertilizer will do. To further prevent deformed roots, keep the area free of weeds. "Danver's Half Long" - Early, sweet and easy growing. "Imperator" - A Long variety that keeps its sweetness and crunch in storage. "Little Finger" - Sweet 3-inch "baby" carrot. "Paris Market" / "Thumbelina" - Plump, round and bite-sized. Insects: The biggest pest is the carrot rust fly. It lays its eggs in the soil near the carrot top. When the eggs hatch, the larva work their way down into the soil and then into the carrot's roots, where they feed and create tunnels through the carrot. Carrot weevils can do similar damage. You can foil some pests by rotating where you plant each year, but the easiest method is to grow your carrots under row covers. Nematodes can become a problem later in the season, causing deformed roots. 4-Footed Pests - Even if they don't notice the roots growing below the soil surface, there are plenty of animals that will want to eat the tops of your carrots and a few who will dig deeper. Deer, groundhogs, rabbits, opossum and several others will need to be kept out of the garden. Diseases: There are a handful of leaf spot and bacterial diseases that can affect carrots, like Alternaria leaf blight, carrot yellows, and bacterial soft rot. There is not much you can do once the plants are infected. Keep a close watch and remove any plants showing signs of disease. Also, clean up all debris at the end of the season and move your carrots to a different section of the garden next year.